When I was growing up, one of my mother's signature dishes was shallow-braised pork shoulder steaks. She didn't call it that, and I doubt she thought in terms of signature dishes, but it was something that she made quite often. When I watched my mother make those pork steaks, it was the most puzzling bit of cooking alchemy that I ever witnessed. She used a huge wobbly frying pan that had warped from abuse, so it was impossible for the bottom to heat evenly. Sometimes the pan was covered, sometimes it wasn't. Sometimes she'd let the liquid cook out, and then she'd add more and cover it again. Sometimes she'd turn the heat off and just let it sit, and then turn it on again later. It was almost like she had no idea what she wanted to do, or that she had no idea how long it would take to cook properly. But in the end, the dish turned out exactly the same every time. She probably knew what she was doing, but it confused the heck out of me. Or maybe she was just lucky. I still love pork shoulder chops, but I don't make them exactly the way mom made them. 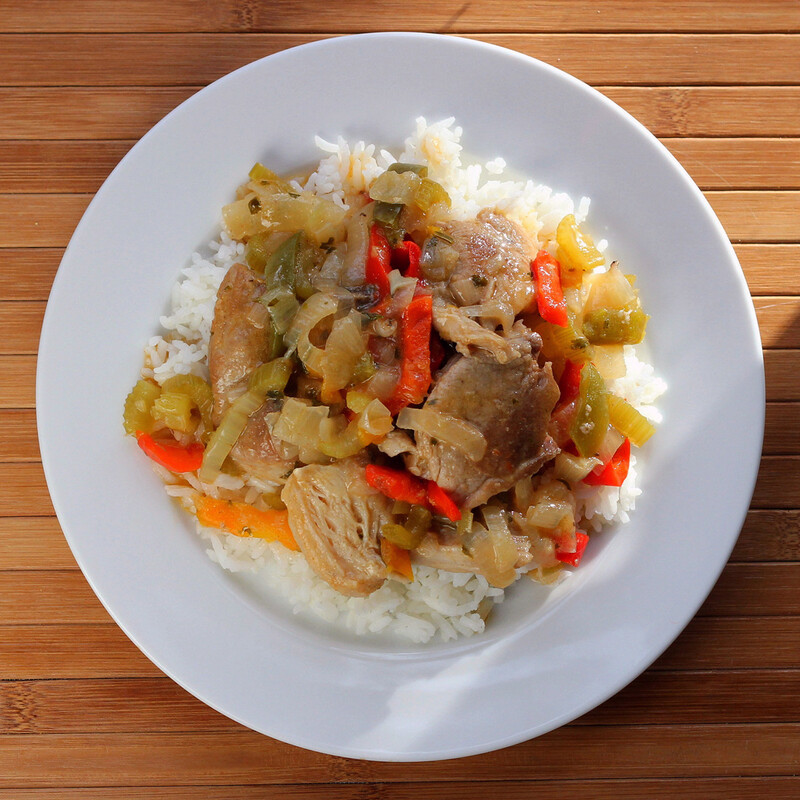 Hers typically had green peppers, maybe some onion, and they were finished with just a little bit of a cornstarch slurry to thicken the sauce at the end of cooking. And that's about it. They were simple, but good. On the other hand, I tend to add extras. 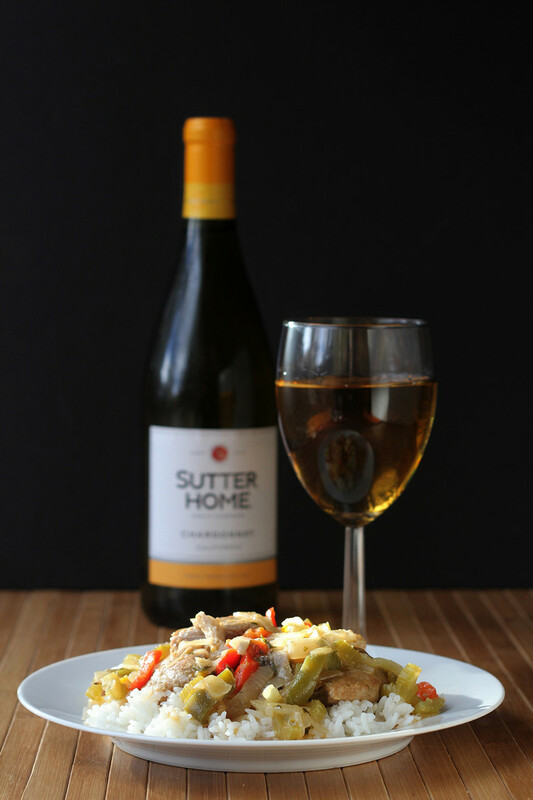 If you think it's unusual to cook with Chardonnay, as far as I'm concerned, you can cook with pretty much any wine that you like - you just need to make sure the flavor of the wine pairs well with the food. And a glass of wine to go along with the meal would be a great idea! This post is sponsored by Sutter Home, who sent me Chardonnay to work with. Other participating bloggers received other types of wine. Sutter Home also provided the giveaway items. Heat the vegetable oil on medium-high heat in a large frying pan with a lid or other wide shallow pan that will easily fit the steaks. Add the shoulder steaks and brown on both sides. While the pork shoulder is browning, you should have time to slice the celery into 1/4-inch pieces and to quarter the onion and slice it into a similar thickness. When the steaks are browned, add the celery, onion, chardonnay, lemon juice, salt, pepper, and paprika, and give it all a little stir. The shoulder steaks shouldn't be submersed in the liquid, but there should be at least 1/4-inch of liquid in the bottom of the pan. If you have a very large pan, you might need more liquid. Add more wine, or you can add water, if you prefer. Bring the liquid to a low simmer and cover the pot. Let it simmer slowly for 60 minutes, then add the parsley and bell pepper strips (I used frozen multi-colored pepper strips, but you could core, seed, and slice fresh bell pepper, if you prefer. Cover the pan and continue cooking on a low simmer for another 15-20 minutes, The pork should be fork-tender. Remove the cover and continue cooking until the liquid has evaporated and thickened to create a sauce. If you like (and it's what mom did) add a teaspoon of cornstarch to 2 tablespoons of cold water and add it to the pan, Cook, stirring, until the sauce thickens even more and coats the meat and vegetables. Serve hot. I served it with rice, but it's also good with simple boiled potatoes. Don't forget to check out the other two bloggers participating in this giveaway to see what they made and what wines they used. Foodhunter's Guide to Cuisine made Orechietti with Veal, Porcini, and Spinach. Thanks to the nice folks as Sutter Home, we're doing a giveaway of these items - all to one winner! This post, as well as the giveaway, is sponsored by Sutter Home. I was having a bit of a cake crisis. I wanted to make a cake. I tried to make several cakes. But the recipes I tried weren't working. First, I tried something called "Wonder Cake" from a cookbook written in 1894. It was pretty horrible. Then I tried a couple more modern recipes that failed. It happens sometimes at high altitude - cakes can be pretty finicky up here. I probably could have fixed those recipes with some troubleshooting, but I wasn't in the mood for that. I just wanted to find a recipe that worked from the beginning. Without testing and tweaking and re-testing. I decided to turn to a cookbook that had worked for me before - Fine Cooking Cakes and Cupcakes . I make a crumb cake from the book a while back, and it was pretty danged good. So I browsed through the book to find something else. I was temped by a few different yellow cakes, but went in the opposite direction and chose a chocolate cake instead. The title made me happy: Fastest Fudge Cake. I like fast and I like fudge. And, I had all the ingredients I needed to make the cake. While several of the other cakes I made had risen and then fallen - either in the oven or while cooling - this one rose politely and didn't collapse. It was perfect. Heat the oven to 350 degrees. Spray a 9-inch round cake pan with baking spray . In a small bowl, whisk the flour, cocoa, baking soda, and salt together. If it's lumpy, sift it. If it's not lumpy, you're good to go. In a large bowl, stir the butter and sugar together. Add the eggs and vanilla and stir until well blended. It will take some stirring, but it will blend. Add the flour all at once and stir until all the flour is moistened. Add the water and stir until it's incorporated and the batter is smooth. Scrape the batter into the prepared pan. Bake until a toothpick inserted in the center of the cake comes out clean, about 30 minutes. Let the cake cool in the pan for 10 minutes before turning it out of the pan. Let the cake cool completely before frosting - I used a poured ganache, but use whatever you like. This time of year, there's pretty much always some kind of soup happening. I make enough to last a few days, and when that's gone, another soup makes its appearance. I like to vary the soups, so every new batch is significantly different from the one before. So ... if the tomato noodle soup is nearly gone, the next one might be chicken and rice. That could be followed by ham and bean or cream of mushroom. Later, it might be beef barley or split pea. 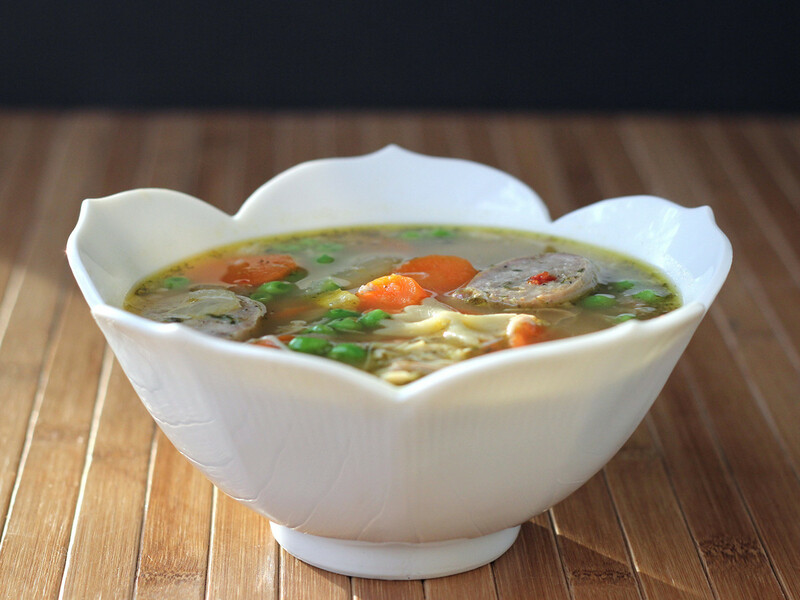 Some soups have meat in them, some have a meat (or poultry) base, and some are completely vegetarian. There's a lot of soup around here. So when my buddies at 37 Cooks hosted a challenge sponsored by Bilinksi's sausage and they sent chicken, kale, and balsamic sausage ... well, the first thing I thought of was soup. I decided to amp up the chicken content by using chicken stock and chicken thighs along with the chicken sausage. 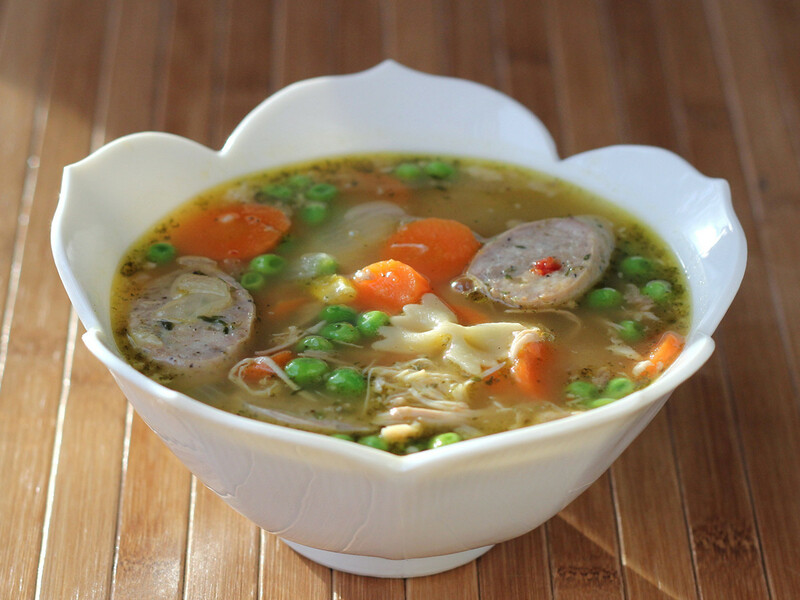 There's no doubt at all that this is a chicken soup. If you happen to have cooked chicken to add to the soup, you can skip cooking the thighs in the stock - the stock won't be quite as rich, but it will still be pretty terrific. Heat a Dutch oven or other heavy-bottomed pot on medium heat and add the olive oil. When the oil is hot, add the chicken thighs, skin-side down. Cook until the skin is nicely browned, then flip the pieces over and cook on the other side until browned. Add the chicken stock. Cover and simmer until the chicken thighs are cooked through and tender - figure on 45 minutes to an hour. Remove the chicken thighs and skim the fat off the top of the stock. If you prefer, you can do this step ahead of time and refrigerate the stock, which makes it easier to peel off the solidified fat. Remove the skin from the chicken thighs and remove the meat from the bones. Shred or chop the chicken meat and refrigerate until needed. Add a quart of water to the stock. Peel and slice the carrots into rounds. Add them to the stock. Peel and dice the onion and add the diced onion to the stock. Slice the scallions into rounds - using the white parts tender green parts - and add them to the stock. Add the poultry seasoning and parsley. Taste for seasoning. If the stock was salted, you may not need more now, but if it was unsalted, add salt as needed. Simmer the vegetables in the stock until they are tender. Add the pasta and cook until al dente, then add the peas and corn. Slice the chicken sausage into rounds - or slice on a slight bias to create ovals. Add the sausage and the reserved chicken thigh meat to the soup. Taste for seasoning again and add salt, if needed. Cook for another minute or two, just enough to warm the chicken sausage and meat. I received chicken sausage at no cost to me from Bilinski through 37 Cooks. When I got a copy of Fine Cooking Italian, I bookmarked a ridiculous number of recipes. I love pasta, I love tomatoes, I love cheese, and I love any food that is in the slightest bit Italian. 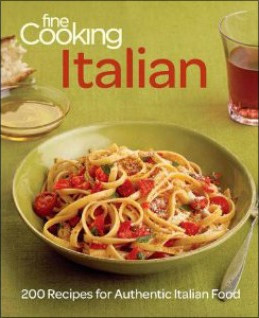 Before you ask if the recipes in this book are authentic Italian - well, the tagline for the book is "200 Recipes for Authentic Italian Food," so there's that. 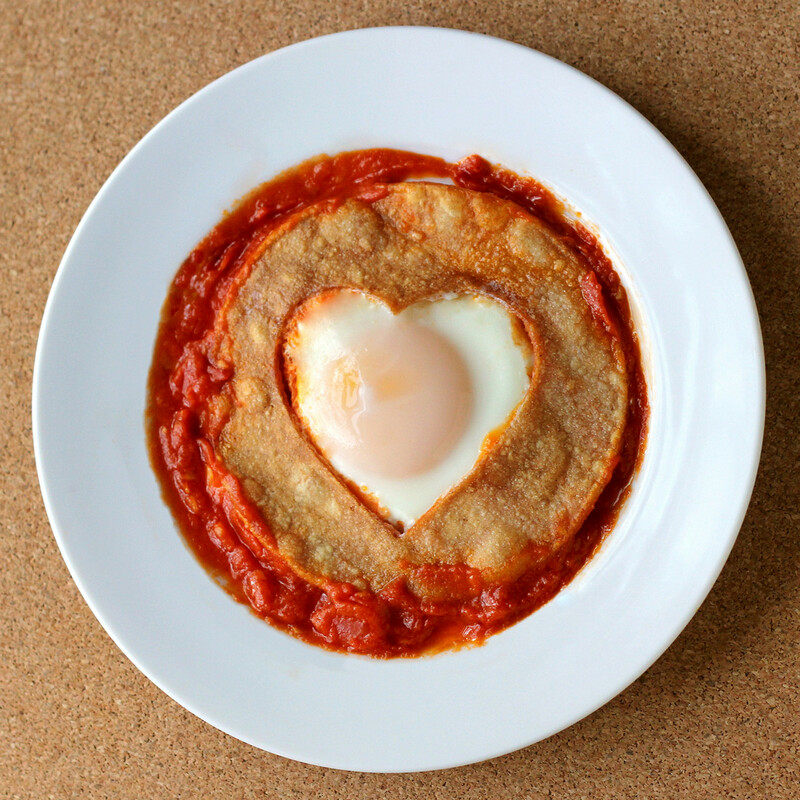 Whether there are grandmas in Italian villages who are making these recipes - well, I haven't a clue. And I really don't care. What I do care about is whether there are recipes I want to make, and whether they taste good. Obviously, I wanted to make them, and I've already tried a few, including a pasta recipe with cauliflower that looked unassuming, but tasted really good. But then I thought I should try something that wasn't pasta, and a recipe for Brussels sprouts caught me eye. I like Brussels sprouts a lot, but I'll be honest and say that I'm usually not all that creative with them. These were glazed with reduced balsamic vinegar and accented with crisp bits of pancetta. Unfortunately, fresh Brussels sprouts were nowhere to be found, so I used frozen instead. It changed the cooking a bit - they didn't brown quite as quickly as fresh ones would have. But the end result was still good. In the end, this wasn't the prettiest dish I've ever made - the super-dark reduced balsamic vinegar coated the sprouts and made them ... well, dark. If the color is too dark for you, a white balsamic vinegar or maybe a sherry vinegar would work. I haven't tried either one, but it seems like it could be okay. If you're worried about how tart this dish might be from the 1/4 cup of vinegar, keep in mind that reduced balsamic vinegar is actually just a little sweet. Meanwhile, the pancetta added its savory and salty goodness. It's not like a salad with vinegar. It's savory for sure, but not jarringly tart. Choose a large saute pan that will allow you to fit all the halved Brussels sprouts in one layer. And make sure you've got a lid for the pan, too. Add one tablespoon of the olive oil to the pan and heat on medium-low heat. Add the pancetta. and cook until crisp, about 10 minutes, stirring as needed. Remove the pancetta with a slotted spoon to a plate lined with a paper towel. There should be about 2 tablespoons of oil left in the pan, If you don't seem to have that much, add some additional olive oil. Arrange the sprouts cut-side down in the pan. Since I was using frozen sprouts and they were a little wet, there was some spitting, so I turned the heat off to add the sprouts to keep my fingers from harm's way. Fresh sprouts would likely be less likely to cause the oil to spit. Or use tongs to add and arrange the sprouts to avoid the splashing oil. 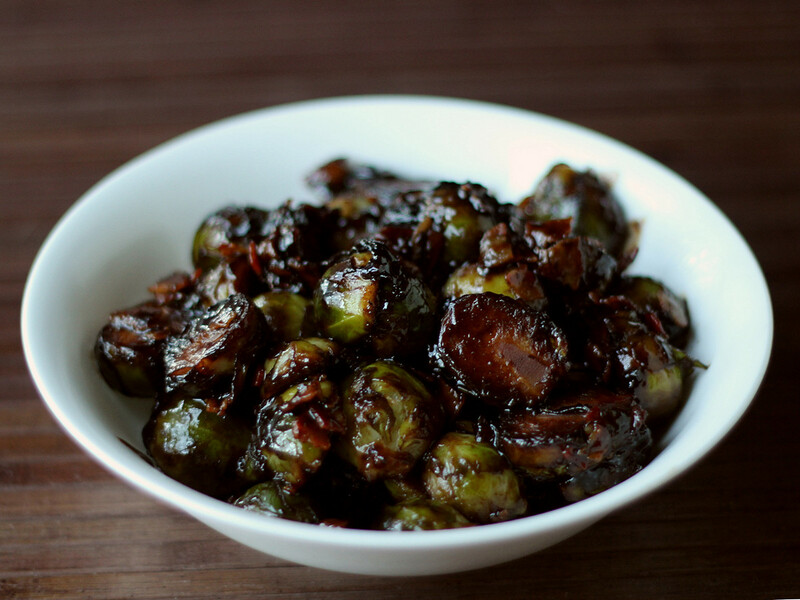 Turn the heat up to medium high and cook the sprouts undisturbed until they're nicely browned on the bottom. My frozen sprouts took about 5 minutes, but fresh ones should take just 2 or 3 minutes. Add the water, cover the pan, and let them simmer until fork-tender but not mushy, about 3 minutes. 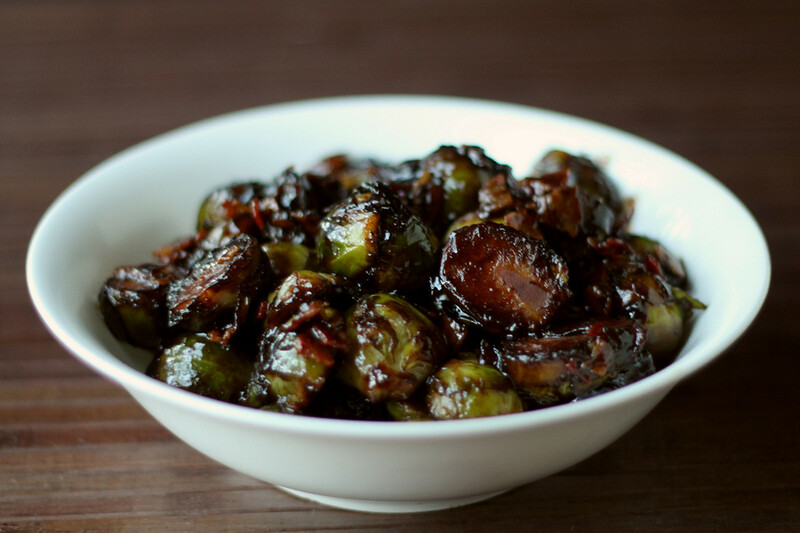 If the water evaporates before the sprouts are tender, add a little more water, 1/4 cup at a time, as needed. Remove the sprouts with a slotted spoon and place them on a plate. If there's any water left in the pan, let it cook off with the pan on medium-high heat. Add the balsamic vinegar and a few grinds of pepper. Boil the vinegar until it's reduced to about half its original volume and it's slightly syrupy, about 2 minutes. Reduce the heat to low, add the butter, and stir until it's melted. Add the sprouts and pancetta back to the pan, stir to coat the sprouts with the sauce, season with a sprinkle of salt and a few grinds of pepper, and serve hot. The other day, I received the book Mug Meals, and it got me thinking. There was a recipe for French toast cooked in a mug, but it called for a sturdy bread like challah (which I didn't have), along with fresh berries (which are out of season). But I liked the idea. While I don't mind making French toast for the two of us, it seems like a lot of mess when I'm making it just for me. I figured that making it in a mug would cut down on the number of things I'd need to wash. Or at least they'd be smaller, right? I plan on reviewing Mug Meals later, after I've had a chance to actually try a few recipes. 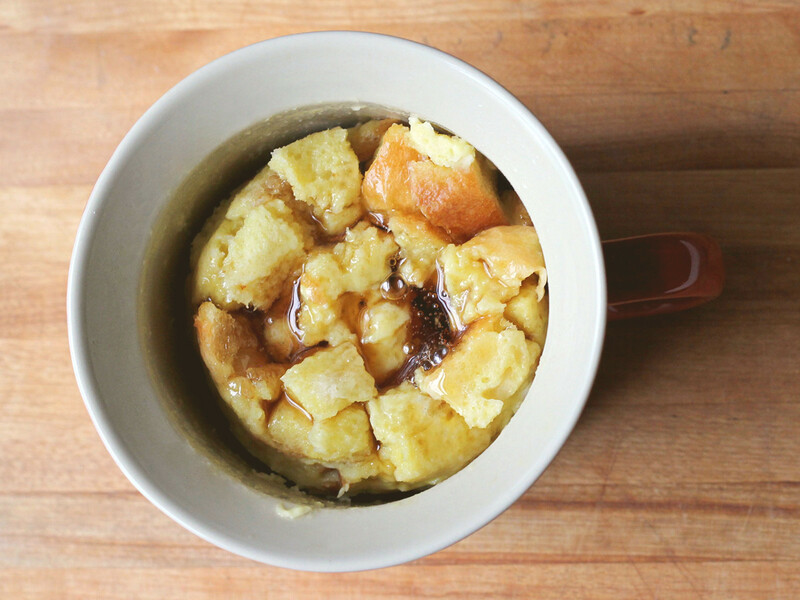 But for now, here's my Mug Meals inspired French toast. You'll need a fairly large microwave-safe mug for this. I used one that was allegedly a soup mug. 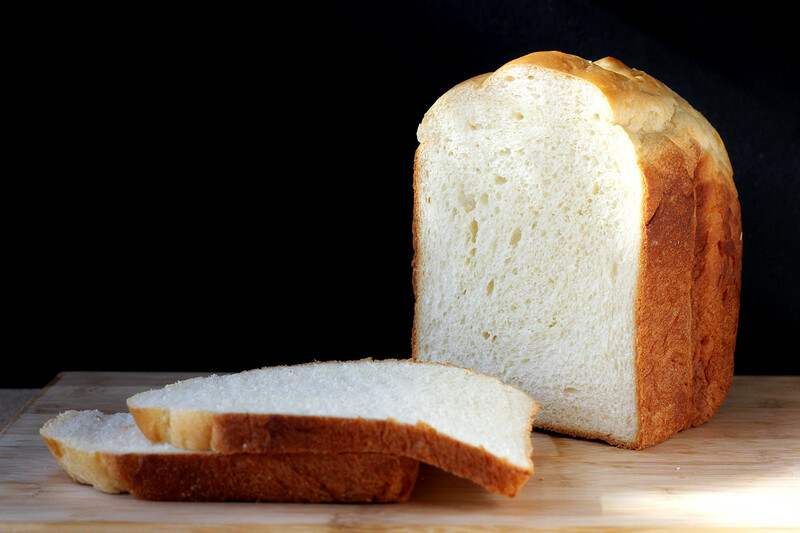 A regular coffee mug might be enough for 1 slice of bread. Put the butter in your chosen mug and melt on high in the microwave for about 30 seconds. Meanwhile, beat the eggs, milk, and salt together in a small bowl. It doesn't need to be frothy - just combined. If you want your French toast to be even softer and more custardy, you can add more milk or cream - up to about 1/4 cup (4 tablespoons) but I suggest that you try with 2 tablespoons to start, and see what you think. When the butter is melted, add the bread cubes, then pour the egg mixture over the bread, making sure to drizzle it over all the cubes. If some are still a little dry, press them down into the mug to get them soaked in the egg mixture. Cover the mug. I use a silicone lid from GIR , but you could use anything that's microwave-safe. The idea is to retain the heat and keep from splatting eggs inside your microwave. Cook for 2-3 minutes at medium power.. You'll need to check the first time you do this, so you know how much time you really need - and it depends how custardy or firm you want the finished product. It will be more cooked around the edges and less cooked in the center, so stick a spoon in there and see what it looks like. If it needs more time, cook a little longer. Leave the mug covered for another minute before you eat. For one thing, it's hotter than heck, so you don't want to eat it just yet. And for another, this lets it finish cooking all the way through. You know how microwaves sometimes don't heat evenly? Yep, this helps the heat even out. Once you've figured out exactly how long you need to cook, you won't need to stop and check, as long as you're using the same mug and similar ingredients. Top with butter and/or maple syrup. Or whatever you normally put on your French toast. Eat with a spoon. You can certainly add other ingredients to the egg batter - vanilla or cinnamon or nutmeg would be nice. But since this is a quick breakfast for me, I go with the basics most of the time. 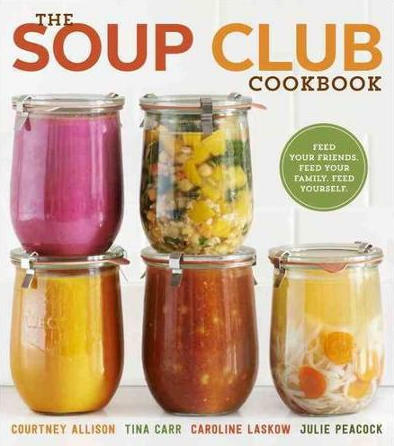 When I got The Soup Club Cookbook for review, I was pretty sure I'd be making a few soups right away. It's winter. Soup is on the table a lot. But then I got distracted by the other recipes. I've got a zucchini lasagna recipe bookmarked for later, and there were some salad dressings calling my name. I love salad. But then I realized I needed a vegetable for dinner. I had carrots in the refrigerator and there was a carrot recipe. So I figured I'd give it a shot. This is the sort of recipe that, after you've made it once, you can simply eyeball the quantities and adjust to taste. It may, in fact, be too simple to warrant a recipe at all ... except that it might not be something you'd think of making unless you first saw a recipe. The great thing about this recipe is that it's simple enough for an everyday family dinner, but you could also make it for a party or event. And the ingredients are things you might have on hand. That's always a huge plus. You can whip it together on a whim. Which, really, is what I did. Whim ... whip it up. Done. The recipe in the book was for 3 pounds of carrots, but I cut it back to one pound, which was really simple math. When you're deciding how much to make, consider that the carrots shrink a lot during roasting, so the volume will be much less than what you start with. On the other hand, the carrots are sweet and rich, so you might not eat as many as if they were simply boiled. Combine the carrots with the olive oil in a large ovenproof pan - it's great if you can get them in one layer, or at least not in a big pile. Bake, stirring every 10 minutes, until the carrots are tender and caramelized, about 40 minutes. Bring the pan out of the oven and put it on the stovetop over low heat. Add the butter and maple syrup and stir until they begin to foam. Continue cooking and stirring until the maple butter sauce has thickened slightly and a spatula dragged across the bottom of the pan leaves a trail. Remove the pan from the heat and sprinkle the carrots with the salt. 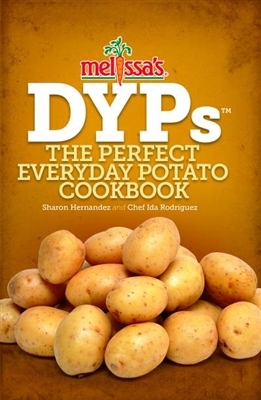 While there are more and more cookbooks these days that deal with single ingredients, Melissa's DYPs: The Perfect Everyday Potato Cookbook is unique in that it focuses on one specific type of potato - the Dutch Yellow Potato. It's a waxy potato with an interior that's more yellow than your average spud. Of course, that doesn't mean you're doomed if you don't happen to have that specific potato on the day you want to make a recipe from this book. Sure, it's nice to hunt down the right one. But you can still use this book if you need to make some substitutions. I wasn't sure what to expect when I got this book from Melissa's. I thought it might be all potatoes, all the time. Multiple side dishes. Many potato-centric dishes. But there were also a whole lot of recipes where potatoes were a component, but not necessarily the star of the dish. Since I'm a big fan of potatoes, I was happy with both options. The first recipe I tried was the DYP Beef Pie, with a base of ground beef a filling of shredded potatoes, and a topping of shredded cheese. It was interesting, as it was, but it also opens the door for all sorts of customizations, like adding jalapenos and salsa, or adding shredded carrots and green beans. Or whatever makes sense to you. The instructions suggested spraying a 9-inch springform pan with cooking spray , but I think you can skip this. But if you want insurance, spray. Combine the beef, bread crumbs, Italian seasoning, 1 cup of chopped onions, eggs, salt, and pepper in a bowl. Mix well, then press onto the bottom and up the sides of the springform pan. Bake for 15 minutes - I put my springform pan on a baking sheet, just in case it decided to leak juices or fat during cooking. It turns out I didn't need to, but I'd do it again. Just in case. Meanwhile, heat the olive oil in a large saute pan on medium heat and cook the potatoes and onions, stirring as needed to keep them from sticking, for 10 minutes. I added some salt and ground pepper to the potatoes, even though it wasn't called for in the recipe. Potatoes usually need a little salt. Remove the pan from the oven - the beef will be partially cooked. Add the potatoes to the pan, then top with the cheese. Return the pan to the oven - the instructions said to increase the heat to 375 degrees, but that was the initial temperature ... but I cooked it at 375 both times, with no trouble. Bake until the top is lightly browned - 20-25 minutes is suggested, but it took 35 minutes for me. Adjust cooking time as needed. When you loosen the springform ring, a lot of fat will drip out, so that's another good reason to have the pan on a baking sheet. I used 2 spatulas to transfer the pie off of the springform base and onto a serving plate. 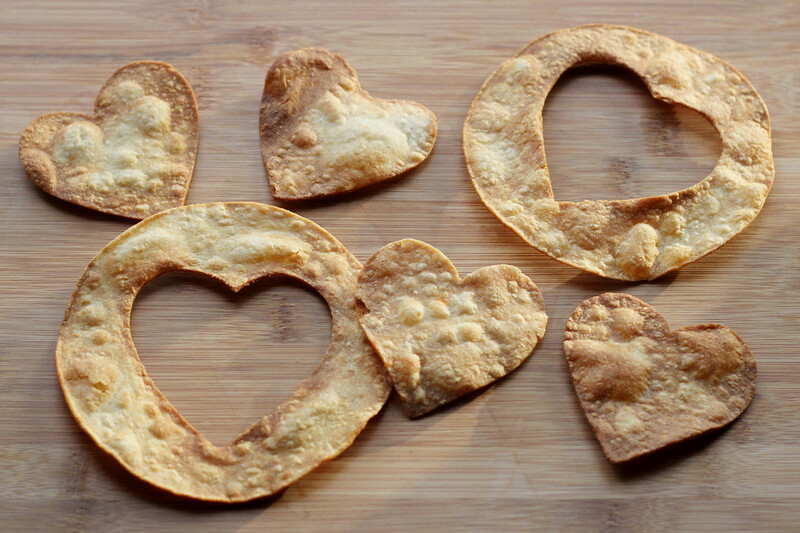 Slice in wedges to serve. Garnish with fresh chopped tomatoes, if desired. *I suggest chopping 1 cup to mix with the meat, and cutting thin slices to mix with the potatoes. When I was a kid, grits were the tiny rocks at the bottom of the bird cage. I was quite surprised when I heard that some people actually ate grits. Really? Rocks???? Wouldn't that be bad for your teeth? But then I found out the edible grits weren't boiled rocks, and that in fact, they were made from corn. Once I found out that I wasn't going to be eating rocks, I was willing to try grits, which led me to polenta. They're closely related. For some recipes, it might be the end use that tells you whether you've got grits or polenta. If it's Italian, it's polenta. If it's Southern American, it's grits. While the corn used for grits in Italy for polenta is different from the corn used for American grits, the packages of coarsely ground corn I normally buy are labeled for use as either grits or corn. And I'm fine with that. While I'd love to have regular access to the special Italian corn, I'm pretty happy with the grits/polenta that I buy at the grocery store. What something is labeled doesn't matter to me as much as what it tastes like, and I like that grocery store stuff. 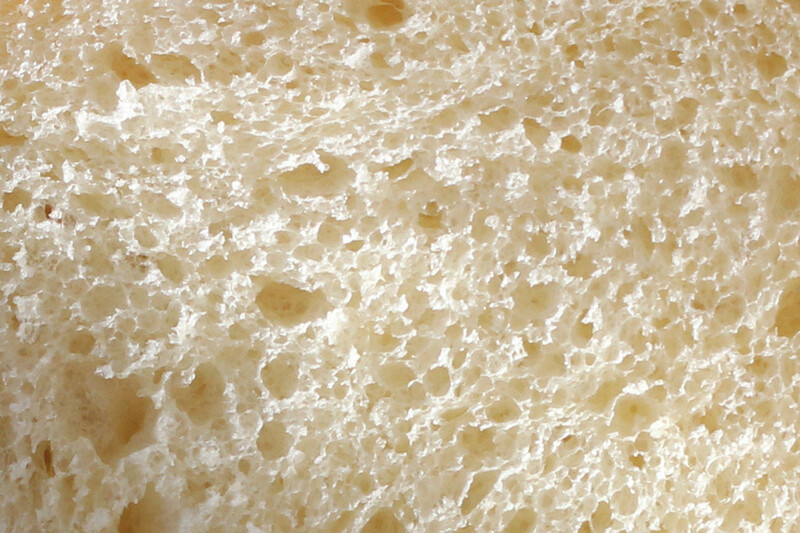 It's tasty, it had nice texture, and you can dress it up any way you like. 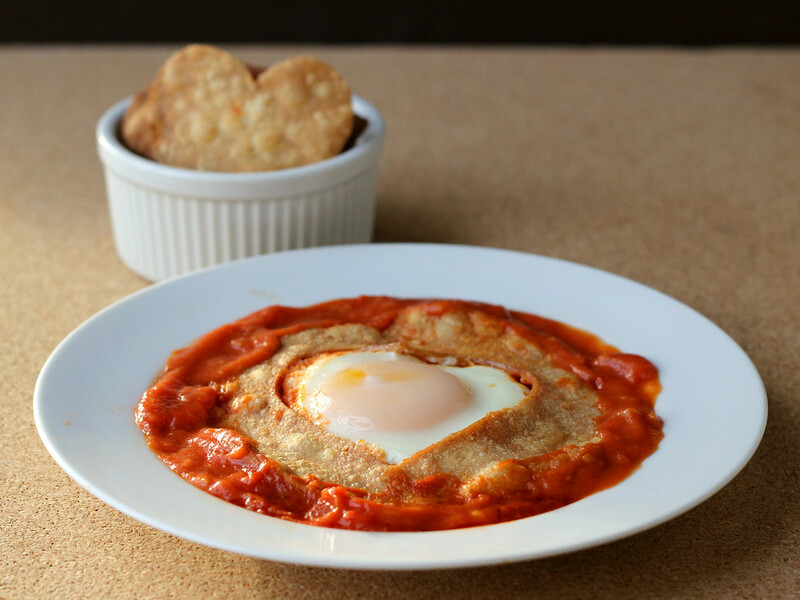 This time around, I decided to make a somewhat simple version of polenta, made even more simple by cooking them in my slow cooker. The beauty of using a slow cooker is that you don't need to worry about stirring, so you can set it and forget it for a while. The downside to using a slow cooker is that they don't heat identically. Some cook at hotter temperatures than others. So the first time you make grits, you may need to adjust the cooking time. To add a little tang to the polenta, I used buttermilk - but no cheese. And to add some savory flavor, I used Better than Bouillon chicken-flavored base. While I usually have home made soup stock in the freezer, I also keep Better than Bouillon products on hand for the times when I need just a little extra flavor. The great thing is that you get that flavor before you end up with too much salt. Put the polenta in your slow cooker and add the water while stirring. Add the butter and Better than Bouillon. Turn the slow cooker to high and cook for 1 1/2 hours or until liquid is gone (but before it starts "frying"). Add the buttermilk and stir to combine. Turn the slow cooker to low and cook for another 30-60 minutes, until the polenta is smooth and creamy, but not soupy. You can serve it as a side dish next to just about anything, but lately I've been eating it topped with a chunky tomato sauce.